Another viewer on my YouTube channel left a comment in my Airship walkthrough video asking if the build was available to download. It wasn’t then. It is now. 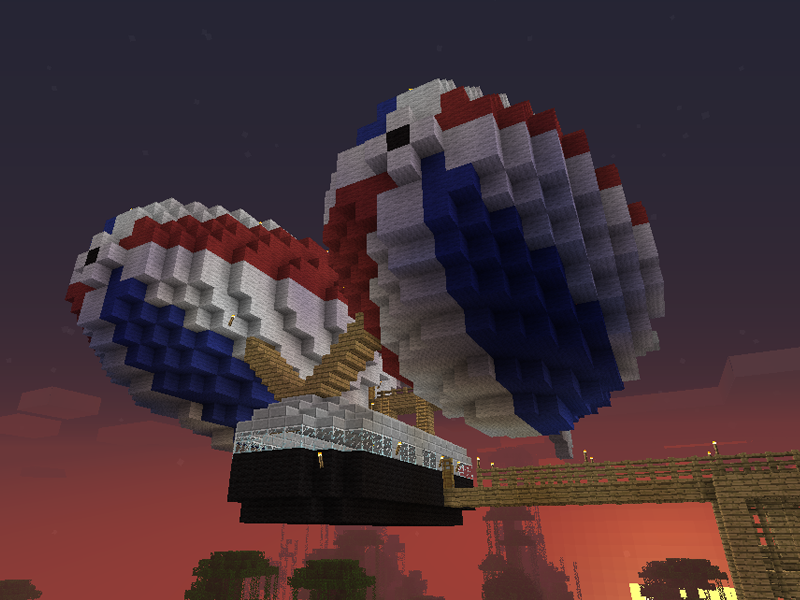 I’d already built the Airship in the Minecraft Structure Planner before building it on the multi-player server just to make sure I made the balloons… well, balloon-shaped. Unfortunately, MSP was abandoned long, long ago, before a lot of the newer blocks were added (like upside-down slabs/stairs) so I had to import the build into a creative Minecraft map then touch it up somewhat before finally exporting a schematic with MCEdit. The schematic just features the Airship itself. I didn’t include the tower/gantry because a) that bit was done freestyle when I was building on the multi-player server and b) it’s not exactly one-size-fits-all. Anyhoo, I’m sure you can knock together a tower if you need one. As with the Clipper Ship schematic, I’ve started a thread on MCSchematics.com where you can download the Airship schematic. Here you go.